Love the sweet taste of honey because it contributes to good health in a natural and immediate way! Honey is one of the oldest sweeteners on earth, and is able to heal your body and keep away various diseases. Honey contains antibacterial, anti-fungal, antiseptic and antioxidant properties, which make it one of the most beneficial foods. For these reasons make sure to always have a jar of honey in your cupboard! A minimal amount of honey is enough to kill the majority of the bacterial cells of the skin surrounding a wound. After a cut e.g. of your hand, the bacteria are “running” to contaminate the wound. Honey can help remove the pus and dead cells in a painless way, while stimulating the growth of new tissue. The journal “Pediatrics” reported that honey works more effectively than syrup to suppress coughing and leads to a peaceful sleep. Honey is able to easily soothe the pain in the neck, especially if you combine it with fresh lemon juice. In other words, honey because of its composition can kill bacteria and viruses. The ancient Greeks ate honey and dried figs to improve their performance in the Olympic Games. Modern studies have shown that honey leads to the maintenance of glycogen levels in the body and improves recovery time than other sweeteners. Unlike white sugar, honey has a wide range of minerals such as calcium, iron, zinc, potassium, phosphorus, magnesium, etc, which aid the maintenance of healthy cells and balance of insulin in the blood. (Read about 20 natural ways to replace sugar in your diet). However, this does not mean that someone can consume huge quantities of honey since it has about 53% fructose (read why fructose is bad for you). According to research there are types of honey, such as therapeutic “Manuka” and “Kanuka”, which can effectively treat acne and skin inflammations. 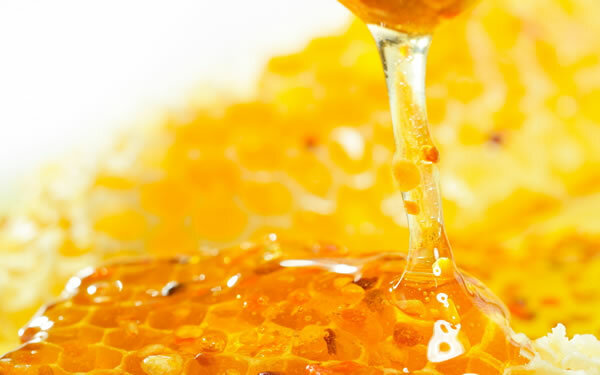 If your face, back or chest is filled with acne pimples, honey is the ideal treatment. For centuries, honey provides a solution against infections due to antibacterial properties. Studies have found that it is full of polyphenols, a type of antioxidant that protects cells and contributes to heart health and protects against cancer. Especially in the summer, you can use honey for the treatment of bites from mosquitoes. This has the potential to relieve the itch, because it has anti-inflammatory properties and may reduce the itching and irritation of your skin. Honey can increase the number of hemoglobin and treat or prevent anemia, which is caused by various dietary factors. Also helps in proper functioning of the digestive system and to solve problems in that area. Read how to increase calcium intake for more details about calcium intake. I love honey. I suffer from hay fever and taking organic honey that is produced locally can be more effective at combating allergy attacks. I also use New Zealand Manuka honey which has powerful anti-bacterial, anti-fungal, antiseptic and antioxidant properties. I love honey, too! Honey is fantastic for when I get a sore throat from the flu or cold! I find that two tablespoons of honey at breakfast and dinner soothes my throat the best. Thank you, Jo , for informing me about New Zealand Manuka honey! I will definitely try it.